Seen to be one of the biggest benefits to 1300 numbers word marketing is that the message in the form of a phone word will reach masses of people all at once. This is far more powerful than radio or television advertising where marketers would need to rely on people either listening or watching the ad being displayed. Even bulletin boards as a huge in your face type of advertising isn’t nearly as effective as phone words are as people have to walk pass them. Another thing often not taken into account is that word marketing is the preferred way for consumers to get in touch with businesses. They love the fact that companies think of ways to making it easier for their customers to remember their contact number, which in a huge way shows they care as it would require money to be spend in registering for 1300 numbers. If companies are too loud in your face with marketing methods used, which can include cold calling, then it is unlikely that consumers would be attracted to do business with them in the first place. Whereas phone words uses a different marketing tactic that is more of a soft sell where the customers are made to feel important enough as they can see the relevant company cares for them in using 1300 numbers. The really cool thing about 1300 phone words is that you can have it listed on your website, vehicles, or on your store windows for all your customers to see take note of. It will definitely benefit your profit margins in creating an awareness about your products and services everywhere your prospects go. Your phone word or phone name is your message to the world out there. Often times, marketing your brand through a radio or TV commercial is considerably more expensive than using word marketing. You could still make the necessary changes to your 1300 numbers if need be without running into a lot of trouble. In addition, phone words as marketing messages serves to boost your future revenue and is a superb ROI which other types of advertising will find hard to imitate. Word marketing is one of the best ways to communicate what your business is about and driving them to your product or service. It sure is a great help to any Australian business owner. 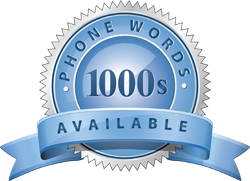 Now is the time to utilise the power of 1300 numbers as the availability of suitable phone words are fast running out.